This page is designed to explain the hobby of balloon chasing. It runs through an actual balloon chase that I participated in. This took place on July 1, 2000. Click Here for a larger view of this diagram The overall idea is to launch a balloon with a payload that will enable scientists (and just plain enthusiasts in general) that will take observations of a wide variety. 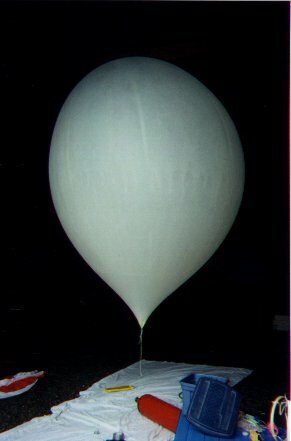 The balloon is not you average children's "$1.00-a-bag" type of balloon, but is - instead - an expensive, helium filled ~15 foot tall that can be used to take small scientific instruments into the stratosphere for taking measurements and imagery. While we hope to achieve some scientific goals, the primary mission is just plain fun, and anybody is welcome to participate - regardless of scientific background, or lack thereof, so really this is a hobby for everyone. 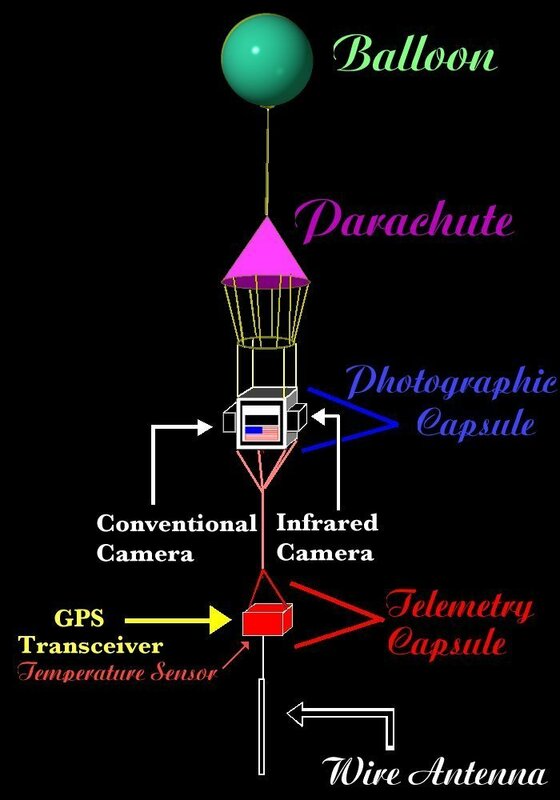 (a) the balloon itself, (b) a parachute (to facilitate a softer landing), (c) the photographic capsule, and (d) the telemetry capsule. 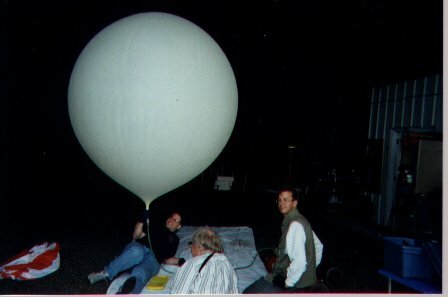 This picture shows Paul Verhage, the resident expert in this effort, getting the ballon ready for inflation. Hope you have enough helium, Paul! This picture gives you a sense for how big the balloon really is. Pretty good size! 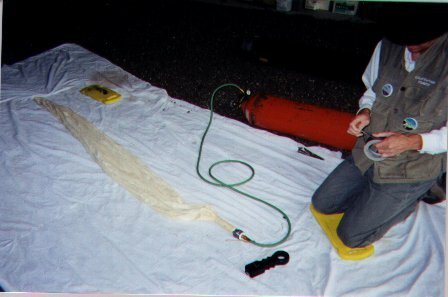 This is me (Paul McCrone) filling the balloon with helium (no, I did NOT inhale!) It was pretty much a lot of fun, but do NOT let go, for ANY reason! Also, supervising the operation was Paul Verhage. 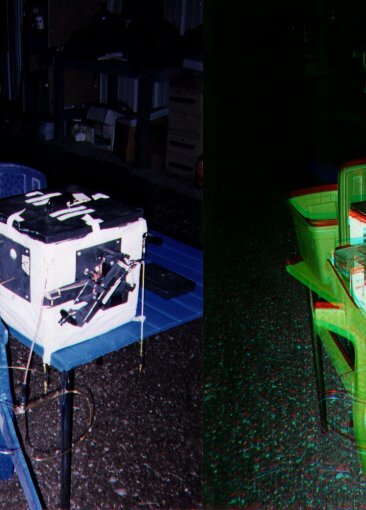 This picture shows the photographic module. Paul Verhage is setting this up to take some FANTASTIC pictures from the surface of the earth to about 91,000 feet - well into the stratosphere. Paul was going to send a styrofoam plane up also, but this was cancelled at the last moment: we we going to launch 2 balloons, but the 2nd balloon had a hole in it, so we had to scrub tht launch. 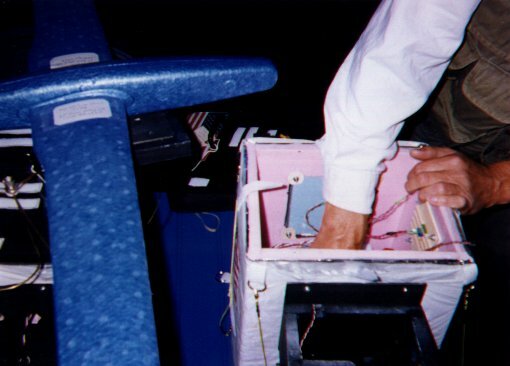 This picture shows the other photographic module that was intended for the second balloon. The strange black appendage that you see is actually a robot arm with a small TV camera on it! We had hoped to get liveTV pictures from the second balloon. We were pretty excited about this, and had high hopes. I hope to see this work in real-time someday in the future. Please hit HEREto go to the next page.